Traveling to Colombia and New York, Bulltick’s Research Team last week met with top institutional clients, made multiple media appearances and gave public speeches. Last week, Bulltick’s research team hit the road to touch base with clients and disseminate the team’s economic views while holding more than ten conference calls with clients that week, a tumultuous one for markets. Clients’ concerns centered on the impact of a potential US military strike in Syria, potential Fed tapering in September, and, following soon thereafter, the debt ceiling debate, budget battle, and Fed Chairperson selection. Bulltick’s head of research and Managing Director, Alberto Bernal, traveled to Bogotá, Colombia to meet with some of Bulltick’s top institutional clients, deliver a speech at a top economic conference, and appear on various radio, television, and print media. Bulltick’s senior macroeconomic strategist and Director, Kathryn Rooney Vera, traveled to New York City and reached a broad audience via internet and televised media, sharing her views on the macroeconomic picture and strategies for investors’ portfolios. Kathryn, along with Alberto, kept up the publishing efforts, delivering the team's global economic and market strategy views to clients on a daily basis. Last week, Alberto Bernal traveled to Colombia, where he met with some of the firm’s biggest institutional clients, delivering his views to entire trading floors, and delivered a speech on economic policy and his market outlook to an audience of more than 200 people. In a particularly active week, Alberto last week gave interviews to two local Colombian radio stations, and published two opinion columns in national newspapers, one of which can be viewed here in Colombia’s “La Republica” newspaper. 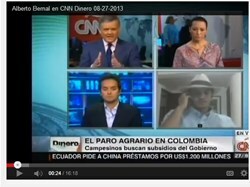 Alberto appeared on the internationally-televised “CNN en español” as well, discussing agrarian strikes in Colombia, a live television interview that can be seen here. Alberto commented on the negative outcome for Argentina in its debt default case in the Second Circuit Appeals court in a Reuters article published August 27th, entitled “RPT-UPDATE 2-Argentina offers bond swap to skirt U.S. court rulings” which can be viewed here. Alberto gave a radio interview on Argentina’s “Blue Radio” discussing the same outcome. Recognized as a top Wall Street sovereign analyst for Argentina, he appeared in reputable Argentine periodicals “Ambito” and “Cronista” with his expert and highly-sought-after views. Kathryn Rooney Vera appeared in a three part series from the New York Stock Exchange in Manhattan broadcasted on all major Latin American online newspapers. Kathryn gave her views and insight on last week’s market-moving events and data (see Part I here, in Spanish). She provided her perspective on the Fed’s taper timing and on the progression of the US economy (see Part II here) including the strength of the housing sector recovery and impact of the more than 1 percentage point jump in mortgage rates in the past three months. In the final segment (See Part III here), Kathryn discussed the global picture, analyzing both recent Chinese data and what it means for that economy’s growth rates as well as in Latin America, Brazil and Mexico’s monetary policy and growth potential as well as heavy commodity exporters Peru and Chile. While in New York City last week, Kathryn taped a program for the program “Globoeconomia” that appears on CNN en español. The 20 minute long program will set to air multiple times on that network this upcoming weekend, reaching a wide range of audience. Kathryn provided her insight and analysis on global macroeconomic trends and the impact on global markets. Bulltick Capital Markets Holdings, LLC, through its subsidiaries, is a securities brokerage, asset management and investment banking firm that provides its clients with diversified financial products by leveraging its Latin American roots and international expertise. We offer insight, opportunities, and top execution services to financial institutions and qualified investors. Headquartered in Miami, Florida with offices in Mexico City and Bogota, we are optimally positioned to serve the needs of Latin American and other clients seeking access to and expertise in US and global securities markets. We maintain our local roots, insight and networks within Latin America for the benefit of our clients. We offer our clients the personal service and flexibility of boutique firms along with the financial capabilities of larger institutions. We deliver services through five business lines: Sales and Trading, Full Service Brokerage, Wealth Management, Investment Banking, Research.